At Dr. Gretchen J. Brewer, O.D. & Associates, your vision, health and lifestyle are important to us, so we pride ourselves on equipping our practice with the latest and most innovative technologies for the benefit of our patients. We've chosen these technologies and solutions to ensure that your eye exam at our offices is efficient, productive and pleasant. 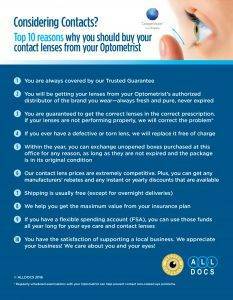 Our ongoing mission is to provide you with the best and most comprehensive eye exam & eyecare services. Annual eye exams are vital to maintaining your vision and overall health. We offer the Optomap® Retinal Exam, using the state-of-the-art Daytona Optomap® Retinal Camera, as an important part of our eye exams. The Daytona Optomap® Retinal Camera produces an image that is as unique as you fingerprint and provides us with a wide view to look at the health of your retina. The retina is the part of your eye that captures the image of what you are looking at, similar to film in a camera.